Johnson & Johnson was founded over 125 years ago in the year 1886. However, it wasn’t until 1959 – 73 years and 2 major acquisitions later – that J&J developed its significant presence in the pharmaceutical industry. In 1886, three brothers – Robert Wood Johnson, James Wood Johnson and Edward Mead Johnson – began the company, Johnson & Johnson, in New Brunswick, New Jersey in the United States. It’s said that the Johnson brothers were inspired to start the business in order to create a line of ready-to-use surgical dressings, after hearing a speech by antiseptic advocate Joseph Lister, in 1885. Robert Wood Johnson served as the first president – the company became incorporated in 1887 and throughout the nineteenth century, Robert worked to improve sanitation practices. A year later, J&J pioneered the first commercial first aid kits, which were initially designed to help railroad workers, but soon became the standard practise in treating injuries. In 1894, J&J’s heritage baby business began, by the launch of maternity kits. These kits had the aim of making childbirth safer for mother and babies. Johnson’s Baby Powder also went on sale during this year and was extremely successful. Robert Wood’s granddaughter, Mary Lea, was the first baby to be used on the baby powder label. Between 1896 and 1897, J&J enabled a huge step forward for women’s health when it manufactured the first mass-produced sanitary protection products. When Robert Wood died in 1910, his brother James Wood became president, before James’ son, Robert Wood Johnson II became president in 1932. One of J&J’s subsidiaries is Ethicon, which is a manufacturer of surgical sutures and wound closure devices. It was incorporated as a separate company in 1949 so as to expand and diversify the J&J product line. Following World War II, Ethicon’s market share in surgical sutures rose from 15% to 70% worldwide. In 1959, J&J acquired McNeil Laboratories in the US and also Cilag Chemie, AG in Europe. These two acquisitions enabled the company to gain a significant presence in the field of pharmaceutical medicines for the first time. One McNeil product was the first prescription aspirin-free pain reliever, Tylenol (acetaminophen) elixir for children. Under J&J’s acquisition, the product became available without a prescription a year later and earned the status as the pain reliever doctors and paediatricians recommend the most, according to the company’s history. It was in 1961 that Belgium’s Janssen Pharmaceutica N.V. joined the J&J Family of Companies. Its founder, Dr Paul Janssen, is recognised as one of the “most innovative and prolific pharmaceutical researchers of the 20th century”. Today, Janssen is one of the world’s leading research-based pharma companies and markets prescription medicines in the areas of gastroenterology, women’s health, mental health, neurology and HIV / AIDS, to name a few. United under the common name of J&J, Janssen is now split into three different businesses – Janssen Research & Development, Janssen Healthcare Innovation and Janssen Diagnostics. Some of the most well-known Janssen products include diarrhoea treatment, Immodium (loperamide), antipsychotic Risperdal (risperidone) and Alzheimer’s disease drug, Reminyl (galantamine). Risperdal is well-known due to the controversy in the US following its product launch in 1994. Juries in several US states found J&J guilty of hiding information about adverse effects of the antipsychotic medication. In 2012, J&J agreed to pay US $181 million to 26 states in order to settle these claims. Between 1976 and 1989, James E. Burke was Chairman and CEO of J&J. During this tenure, J&J entered into the areas of vision care, mechanical wound closure and diabetes management. It was also during this time that J&J opened the first operating companies in China and Egypt. During the 1990s, Ethicon’s Endo-Surgery pioneered minimally invasive surgery, which uses very small incisions and helps patients recover faster than with traditional surgery. In 1994, the first coronary stent was created by J&J and was called the Palmaz-Schatz stent. This move revolutionized cardiology – coronary stents keep vessels open so blood can flow to the heart. Later, another of J&J’s companies, Cordis Corporation, introduced the first drug-eluting stent, which helped prevent the arteries from re-clogging. Cordis was founded in Miami in 1959 and develops and produces medical equipment to treat patients who suffer from cardiovascular disease. Beginning in 2003, J&J became involved in a series of litigations with Boston Scientific involving patents covering heart stent medical devices. Both parties claimed that the other had infringed upon their patents. The litigation was settled in 2009, when Boston Scientific agreed to pay $716 million in September and an additional $1.73 billion the following February. William C. Weldon became the Chairman and CEO of J&J in 2002. Under his leadership, the company entered new therapeutic areas. One of these new areas was HIV / AIDSs, which came about through the acquisition of Tibotec-Virco BVBA, to help address the vast unmet needs of patients with HIV / AIDS and other infectious diseases like tuberculosis. In 2006, J&J acquired Pfizer Consumer Healthcare for $16.6 billion in cash. The acquisition included worldwide leading brands such as Listerine oral care products and the Nicorette line of smoking cessation treatments. 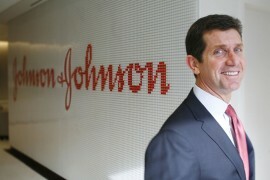 Alex Gorsky was appointed Chief Executive Officer of Johnson & Johnson in 2012. Today, the J&J Corporation includes over 250 subsidiary companies, with operations in over 57 countries and products sold in over 175 countries around the world. The company focuses on three main areas: Consumer, Medical devices and diagnostics and Pharmaceuticals. In 2012, worldwide sales were $67.2 billion, while the total investment in research and development was approximately $7.7 billion. While no one can predict the future for J&J and its subsidiaries, the company’s pharmaceutical segment has an idea of where it wants to be after it announced plans to submit 10 new product filings for regulatory approval over the next four years. These products are aimed at addressing serious unmet medical needs, such as Hepatitis C, schizophrenia and influenza.